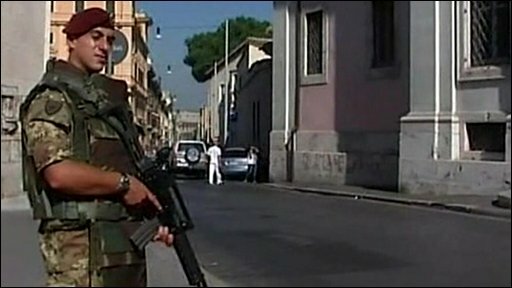 Italian troops have begun patrolling cities as part of a government campaign to combat crime and boost security. Some 3,000 soldiers will be deployed over the next week in major cities including Milan, Rome and Naples. They are patrolling alongside police officers and guarding high-profile tourist sites and embassies, as well as immigrant holding centres. 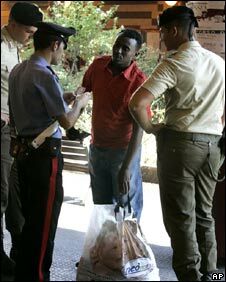 Critics say the move sends a message that Italy is swamped by crime and that its police are not up to the job. The deployment is due to last for six months. The BBC's Mark Duff in Milan says troops made their presence discreetly felt from first light, at the city's main railway station and main square, the Piazza Duomo. Those patrolling city centres wore working rather than combat dress, and carried only sidearms - though those guarding embassies and other sensitive sites were more heavily armed. Defence Minister Ignazio La Russa said that after six months the government would "make an evaluation to see whether it has worked and should be extended to other cities". ''This is not a militarisation of cities but a clear response to the perceived demand for greater security," he said last week. However, no soldiers were on patrol in central Rome after the city's mayor, Gianni Alemanno, said he did not want to frighten tourists. Right-wing Prime Minister Silvio Berlusconi swept to power in April's election on a tough law-and-order platform, promising new measures to curb illegal immigration and combat crime. But his government has also been accused of whipping up a xenophobic mood against the illegal immigrants it blames for much of the serious street crime in Italian cities. Ministers say they are simply responding to Italians' fears. A recent study showed that Italians have never before been so worried about their vulnerability to crime. But shadow interior minister Marco Minniti said: "It's an image-building operation that risks backfiring." "Soldiers patrolling the centres of cities that are our greatest tourist attractions is not a very nice calling card for Italy at the height of the tourist season," he said.